Community Acupuncture – Second Wednesday of every month. Here’s your chance to receive acupuncture for only $30! 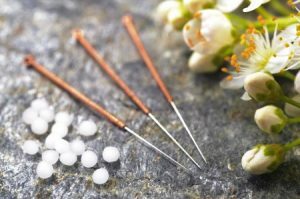 We are re-creating the traditional way of receiving acupuncture. Schedule your appointment anytime between 4 pm—6:30pm. Your initial visit will require a little paperwork and a private consultation with our acupuncturist. Then you will join others upstairs in our loft and receive your personalized acupuncture treatment. Since most issues can be accessed through points located on your arms and legs, you will remain fully clothed! While you recline in a chair, relax and enjoy soothing sounds: music, waterfalls, and wind chimes! The energy shared will be very powerful! Please feel free to bring a pillow and/or a cover up if you feel you might need it. This is a great inexpensive way to give acupuncture a try for whatever ails you. No issues? Try it for relaxation and de-stressing. You will be amazed! CALL AND RESERVE YOUR PLACE NOW!